Andrew Cuomo hasn’t come around on the Move NY plan, and Uber beat back City Hall’s proposed cap on new black car licenses for the time being. But the de Blasio administration still has options at its disposal to cut traffic. Chief among them is parking policy — especially curbside parking reform. Remember PARK Smart? That’s the DOT initiative, first launched in October 2008, that experimented with variable parking meter rates in a handful of neighborhoods. PARK Smart raises curbside parking rates during the times of day when demand is most intense, seeking to increase the availability of spaces and cut down on traffic caused by drivers circling for a spot. Despite encouraging results, the program has stalled in the last two years. On some commercial streets, the amount of traffic caused by cruising for a parking space isn’t trivial: A 2007 Transportation Alternatives study found 45 percent of drivers on Seventh Avenue in Park Slope were trawling for a spot. A similar study in 2006 found 28 percent of Soho drivers looking for parking [PDF]. DOT launched PARK Smart nearly seven years ago in Greenwich Village, then expanded it to Park Slope. The agency aborted a PARK Smart program on the Upper East Side after opposition from the local community board. The most recent action came in 2013, when DOT rolled out modest PARK Smart reforms in Jackson Heights and Atlantic Avenue. Since then no new neighborhoods have been added to the program. In most of New York, parking meter rates are $1.00 per hour. There are exceptions: Below 96th Street in Manhattan, they are $3.50 an hour, and between 96th and 110th streets, they are $1.50 an hour. Hourly rates last increased in 2013, but only south of 110th Street; the last citywide increase was more than four years ago. PARK Smart makes meter rates more responsive, increasing prices when demand is highest. In Greenwich Village, for example, the rates rise to $5 an hour between 6 p.m. and 10 p.m.; in Park Slope, the price rises to $2 an hour between noon and 7 p.m. In Jackson Heights and along Atlantic Avenue, the prices are graduated to discourage drivers from hogging spots all day. The first 30 minutes cost 50 cents, but if a driver stays for an hour, it increases to $1.50, then $2.50 for 90 minutes and $4 for two hours. In Park Slope, traffic volumes fell 5 percent on Fifth Avenue and 9 percent on Seventh Avenue after PARK Smart was implemented. Spaces turned over faster in Jackson Heights [PDF], leading to a 12 percent increase in the number of drivers using metered spaces. Meanwhile, on Atlantic Avenue, double parking dropped up to 8 percent [PDF]. DOT had been investigating PARK Smart for Myrtle Avenue in Clinton Hill last year, but decided against it. The agency also launched a pay-by-phone program on Arthur Avenue in the Bronx in 2013, along with sensors to monitor open spaces, but these programs have not been expanded. 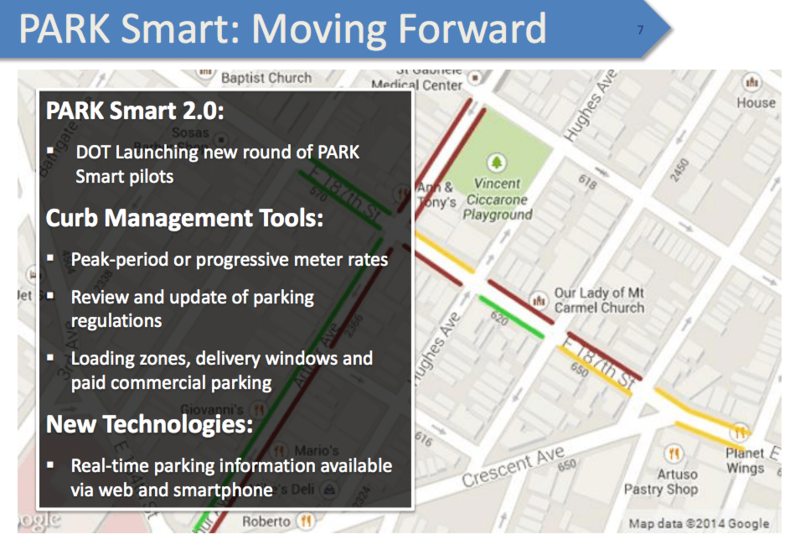 A DOT presentation from last October touted “PARK Smart 2.0,” which would incorporate this type of real-time, user-friendly technology in a new round of PARK Smart neighborhoods [PDF]. But so far, the agency has yet to announce any new initiatives for PARK Smart. Streetsblog asked the DOT press office for an update, but did not receive answers to our questions. Curbside parking reform is no substitute for road pricing, but it does make a difference. And unlike Move NY, or even an Uber cap, it’s entirely within City Hall’s power to implement. And here is the biggest problem with NYC DOT: Terrible communication leads to distrust from everyone, including supporters. Polly Trottenberg expand something innovative that originated under the last administration? HAHAHAHAHAHAHAHAHA. This is all a drop in the bucket compared to the sea of free parking on residential side streets. Because letters to tabloid editors get published, so no Park Smart. Also what’s the point of paying a demand-based price for the meter when you can just double park with impunity? My guess is that DOT doesn’t want to spend the necessary political capital to go up against community boards that are packed with car owners way out of proportion to the actual ownership rate in their district. Many years ago I suggested to the office of then-Manhattan Borough President Scott Stringer that a car ownership question be added to the CB application, right alongside whether the applicant owns or rents, and that answers be used to strike a better balance on boards. They reportedly liked the idea but nothing ever came of it. Parking Reforms Cut Congestion, So When Will DOT Get Serious About Them?